Tyson and Michelle Haworth show us how to germinate marijuana seeds using paper towels. 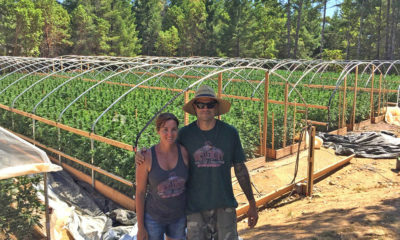 Lots of people are encouraged to start their plants from clones that have already been lovingly grown by cultivators who have an arsenal of knowledge and care techniques. However, for those who are interested in building their crop from ground up, this video from Oregonian Live offers some helpful tips on getting started with cannabis seeds. It involves just a few easy-to-follow steps and a handful of items you may even already have around the house like paper towels, a rectangular plastic container with a lid and aloe vera juice. If you’re still on the fence about whether or not you’re ready to grow, here are 10 things to consider before taking the leap. Not sure where to begin when it comes to selecting seeds? Try starting here. Do you grow cannabis from seeds? Tell us some of your tips in the comments. I started growing auto flowering seeds. I started growing it july,14,2015. Will I have time to grow in the middle of July and stell have time to grow buds. I live in Washington? It is an outdoor grow. I almost always start n find my own phenos from seed! I always use the wet paper towel method! You fold your seeds into a paper towel then wet it. Not dripping but very wet then place in sandwich bag n leave in a dark warm area! Works every time! after my seeds have sprouted I then but some soil in a half of an egg shell until they are big enough to trans plant into a bigger container.Before I set the shell into the container I crack the shell.This I believe puts less stress on the seedling. I agree. I use to do the same with babe chicken eggs. I would help them get out. I takes allot of energy to get out.